Very few modern synagogues have attracted the interest of architects worldwide, and in Israel itself there is possibly only one that has achieved this distinction. 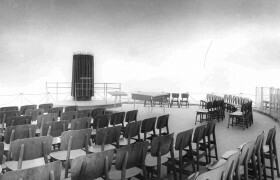 The tiny Israel Goldstein synagogue, on the Givat Ram campus of the Hebrew University in west Jerusalem, is furthermore a building that has much to say about the rival architectural camps that developed following the foundation of the State of Israel in 1948 and which, in a small country, continued to dominate the local scene for a long time afterwards. The synagogue, named after an American religious and Zionist leader, was commissioned in 1957 for an area that was then scarcely developed. 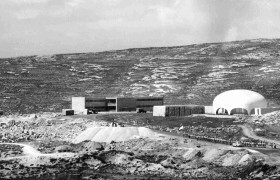 The Givat Ram campus had been founded four years beforehand because the university’s original home on Mount Scopus, on the north-eastern fringe of Jerusalem, had become an inaccessible enclave within Jordanian territory during the course of Israel’s war of independence. The location of the new site, near the government centre, had been determined by one of its architects, Heinz Rau (1896-1965), in his city master plan of 1949, and it took into account the shift westwards of municipal boundaries following the war. The layout of the campus was planned by Rau, Joseph Klarwein and Richard Kauffman, as well as the American landscape architect Lawrence Halprin, and buildings were commissioned from former refugee architects including the Berlin-born Rau himself and Munio Gitai (né Weinraub, a Bauhaus protégé of Mies van der Rohe) as well as younger architects born or trained locally such as Avraham Yaski and Amnon Alexandroni. Transient partnerships between architects were common in Israel then as now. Rau’s buildings for the campus include Manchester House (1957), the home of the Einstein Institute of Mathematics, a stone building around an open courtyard. At the time the synagogue was commissioned the site was still a largely bare, rocky plateau and each building sat on it almost as if in a desert. The principal challenge of this landscape was that of simultaneously grasping the monumental potential of working with stone and developing a degree of finesse in its detailing that avoided any sense of kitsch or historicism. The master at this was Klarwein, who had worked for the expressionist Fritz Höger in Germany (and claimed to have designed Höger’s most renowned churches there), and who was building government offices to the north-east of the university site. This was the tradition to which Rau belonged. 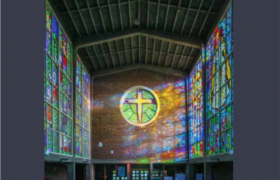 His partner for the synagogue came however from a different background altogether: the much younger David Reznik (born 1923), who had earlier worked for Oscar Niemeyer in his native Brazil, and who had also worked on Manchester House. 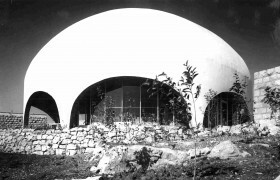 In later years however Reznik too spoke of his admiration for Klarwein’s obsessive interest in careful detail (which was then very unfashionable, and openly derided by many young and instinctively anti-German Israeli architects) and in particular perfecting it for creating modern buildings in Jerusalem from the local pinkish limestone. The building that Rau and Reznik designed takes the form of a gentle concrete puffball hovering just above the surface of the rock, rather as if it had been tossed there by the wind. Reznik’s inspiration for this, he said, came from the upper-room synagogues of Venice and yet, extraordinarily, the results seem more of a harbinger of the pop-up or drop-down plastic shells, lightweight frames and lunar pods that were yet some years in the future. 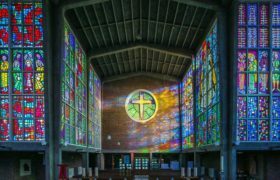 The overall plan and form of the building are extremely simple – just a single domed space for 100 worshippers formed from a reinforced concrete shell, placed above a glazed entry lobby with limestone walls. The shell of the dome is separated from the substructure by a tantalising gap; the effect suggests the spiritual world (of the dome) passing silently around the temporal one (of the floor) without ever quite meeting it. In 1964 the synagogue won the Rechter Prize of the Israeli Architects Association, and Rau, who had only recently returned to Germany, died soon after. Reznik in time became both a prolific Jerusalem architect and an admired teacher. A structure that belongs to the same category as the synagogue is his war memorial of 1974-77 (with Arthur Spector and Michael Amisar) on the fringes of the government complex. It is a cleft monumental stone pyramid on a platform alongside other geometric forms – a set of structures that, Reznik explained, were supposed to evoke a fallen empire. Jerusalem, he says, is a melancholy place. The fragility of the puff-ball synagogue is perhaps more honest at expressing that than are many monumental public buildings. Timothy Brittain-Catlin is the author of The English Parsonage in the Early Nineteenth Century, and his book on Leonard Manasseh and Partners will shortly be published in The Twentieth Century Society’s series of monographs on 20th-century architects. He worked (under the name of Boaz ben Manasseh) as an architect in Israel from 1991-2000 and now teaches at the Kent School of Architecture, University of Kent, where he can be reached on tjb33@kent.ac.uk.